One of the best things about having a high powered Vitamix or Blendtec blender is that you can easily make homemade peanut butter. The simple and easy recipe contains only one ingredient and zero preservatives. This recipe can easily be modified. If you would like something sweeter, add honey. If you enjoy almonds, add almonds for a peanut/almond butter. The great thing about a high powered blender is that you have the ability to modify recipes to meet your taste buds. Below are details to make homemade peanut butter. Pour nuts into the Vitamix container and secure lid. Turn machine on and slowly increase speed to Variable 10, then to High, using the tamper to push the ingredients into the blades. In 1 minute, you will hear a high pitched chugging sound. Once the butter begins to flow freely through the blades, the motor sound will change from a high pitch to a low laboring sound. Stop machine. Store in an airtight container. It can also be frozen for longer storage. 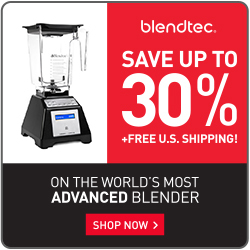 Have you or any of your friends made homemade peanut butter with their Vitamix or Blendtec blender? Let us know what modifications you have made to this simple and easy recipe!